Are you interested in converting my Blu-Ray movies into MOV files to watch on portable players like iPod? You should not miss Pavtube Blu-Ray Ripper, as it will solve all the problems and convert almost all the Blu-Ray to MOV for you. Step 1. Prepare for the conversion. Click here to download Pavtube Blu-Ray Ripper, install and run it. Step 2. Load the Blu-ray disc. 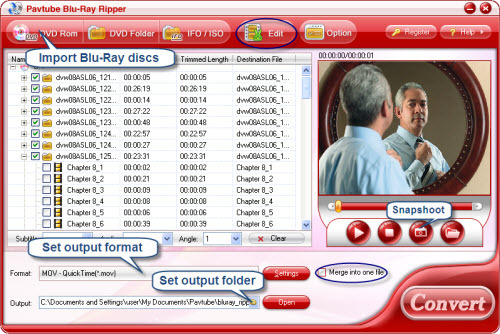 Insert Blu-ray disc and click on the “DVD Rom” button to import Blu-ray movie from the disc, or click on “DVD Folder” button and browse to your target files. Now the selected Blu-Ray files are in the file list. Check the chapters you would like to rip to MOV. You can rename the output file by double click on the file name in Destination File column. Step 3. Set output format. Click on Format bar, select “Common Video” from the format list and in submenu you could find MOV video format. If you prefer HD to SD video, just back to the format list and move down your mouse to point at “HD Video”, here you can find HD MOV. Select the output format you like and then hit on the small folder icon to specify an output folder. Step 4. Start conversion. 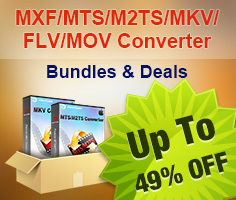 Click on the “Convert” button and the program will rip Blu-ray movies to MOV video format for you very soon. Now you can play the movie on Quick Time Player or portable players! Tip 1: Keep your preferred chapters selected and check “Merge into one” on the right bottom of the interface, you can output these Blu-Ray video segments into one MOV file for your enjoyment. Tip 2: You are allowed to record and output periods of video from anywhere you like. Just click on “Edit” button and choose “Trim” tab.